She was introduced to the Iyengar tradition of yoga while attending Wayne State University, where she received a B.A. in Broadcast Journalism. She continues her studies with her previous college yoga teacher, one of BKS Iyengar’s most advanced level teachers, Laurie Blakeney. Pearson opened YSCYS in May of 2009 and formed IYD in 2013. She served as the Director of IYD until Sept 2016, when the IYDC was formed as a Cooperative. 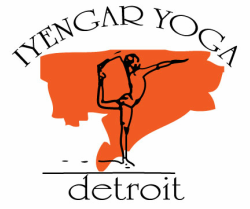 She continues her effort and commitment to broaden the reach of Iyengar Yoga in Hamtramck and Detroit. She has a deep affection for the subject of yoga and is confident in yoga's ability to transform self, community, and society. She teaches at IYDC and has an ongoing Iyengar Yoga class at The Grosse Pointe War Memorial. She offers private and group lessons at the center as well as in your home or business. She is available for consultation upon request. Contact her. Hong Gwi-Seok (Peggy) has been teaching Iyengar Yoga since 2001 and is certified as an Intermediate Junior III teacher by the Iyengar Yoga National Association. Gwi-Seok loves and values Iyengar Yoga primarily as a Healing Justice practice: a path for self- transformation in order to build community and create a more just society. She helps make the sacred art of Iyengar Yoga accessible to all bodies, all abilities, and all economic levels. She studies with Senior Iyengar Teachers in the United States and India, and teaches locally, regionally, nationally, and internationally (in South Korea). A teacher’s teacher, her students characterize her style as dynamic, provocative, holistic, and inclusive. She is also a social justice activist/organizer, poet, and essayist. She updates regularly at yoganun.weebly.com, at Badass Yoga Nun on Facebook, and posts poems and essays at stillinsirsasana.blogspot.com. Erin Shawgo has been studying yoga since 2004 and Iyengar Yoga since 2012. Yoga has become an integrated practice in her daily life, offering her a tool for finding equanimity and working on constant self-examination and growth. Erin began teaching Iyengar Yoga in 2013 and holds an Introductory II certification with the Iyengar Yoga National Association of the United States. Her teaching style is compassionate and creative, with a focus on making Iyengar yoga accessible individuals of all identities and experiences. She believes in the power of yoga to heal and connect individuals and communities and is excited to share the gift of yoga with the Detroit community. Erin also holds her Masters of Social Work with a focus on psychodynamic therapy. Her yoga and therapy practice greatly inform one another and enrich her capacity as both a teacher and a therapist. Meiko Krishok is a chef, gardener, massage therapist and long-time yoga practitioner. She has worked with children and young adults and traveled extensively, and now runs a farm-to-table catering business. Meiko became a certified Intro II teacher with the Iyengar Yoga National Association of the United States in 2016. Her classes are dynamic, playful and challenging. Angela is a writer, educator, and astrology aficionado. She started practicing yoga to help her navigate teaching in rural Louisiana and hasn't stopped. Presently, she coordinates an artist residency hoping to add to the conversation that serves to humanize schooling. Her classes are focused, playful, and a space to build connection and community. She's been teaching under the supervision of Gwi-Seok while teaching at IYD.